Though poultry houses and farms are getting larger, placing a premium on growers’ time, making equipment in a poultry house less labor intensive has its downsides. For example, one of the primary reasons producers have moved to fans with butterfly shutters is that unlike traditional fan shutters, when butterfly shutters become dirty fan performance is minimally affected and as a result frequently cleaning during hot weather to maintain optimal wind speeds is not necessary. The downside is that during cold weather since the fan housing, motor, and blades, etc. are exposed to the warm, moist house conditions, condensation can form on these components which, when combined with high ammonia levels, can significantly reduce fan life. Butterfly shutters are good example of the law of unintended consequences. Doing something for a good reason without fully examining all the possible downsides of the action. In a similar fashion, have attic inlets suffered from the same fate? Has the effort to reduce attic inlet maintenance and management time decreased the overall effectiveness of attic inlets? For instance, does the opening and closing of attic inlets with a machine actually reduce the potential for warm air from a house leaking into an attic space? One of the possible disadvantages of counter-weighted attic inlets is that if not properly maintained and adjusted they may not fully close when exhaust fans turn off, allowing warm, moist air to enter the attic space. If the attic is cold, then moisture in the warm house air can condense on attic surfaces, leading to reduced insulation R-values and the potential for long-term damage to metal and trusses. It is believed by some that controlling attic inlet systems with conventional inlet machines can assure proper closure, eliminating the chance of warm air escaping into the attic regardless of how well they are maintained. Though it is true that a counter-weighted inlet requires maintenance, the fact is that a machine-actuated attic inlet is far more likely to allow warm air to enter the attic space than a counter-weighted attic inlet unless a number of precautions are taken. It is common practice to allow an environmental controller to pre-open a house’s side wall air inlets just prior to the minimum ventilation fans turning on. This feature has its advantages when used in conjunction with side wall inlets; however, when used with machine-actuated attic inlets it can prove problematic. First, a significant amount of warm air can escape into the attic space during the pre-opening period which is often 15 seconds or more. Though once the exhaust fans turn on a portion of the escaped warm air will be pulled back into the house, often it’s not before moisture in the warm air condenses on surfaces within a relatively cool attic space. Of equal or possibly greater concern is that when the exhaust fans shut off there is typically a delay before an inlet machine reacts to the drop in static pressure and actually begins to close the attic inlets. Add to this the 15 seconds or more it takes the machine to close the attic inlets and there is a relatively long period that additional warm air can escape into the attic each time the minimum ventilation fans cycle on and off. Figures 2 and 3 illustrate attic air temperature 18" above a machine-actuated attic inlet on a cool night. Three 36" minimum ventilation fans were operating 90 seconds out of every 300 seconds. The environmental controller was programed to open the attic inlets 30 seconds prior to the fans turning on, assuring the attic inlets were fully opened prior to the exhaust fans operating. After the exhaust fans turned off, it took approximately 20 seconds for the inlet machine to react to the drop in static pressure and fully closed the houses’s 14 attic inlets. The spike in attic temperature illustrated in Figure 3 just prior to the minimum ventilation fans turning on and just after turning off clearly shows how warm air can move into the attic space when there was no negative pressure being created by the exhaust fans and the attic inlets are fully or partially opened. The amount of air moving into the attic space prior to the exhaust fans turning on can be limited by reducing the pre-opening time of machine-actuated attic inlets. For example, when the pre-opening time in the house illustrated in Figure 3 was reduced from 30 seconds to 15 seconds the amount of warm escaping into the attic prior to the fans turning on was roughly cut in half (Figure 4). If attic inlets are not opened prior to the minimum ventilation fans turning on the possibility of warm house air moving into the attic can be virtually eliminated (Figure 5). The downside of not pre-opening the attic inlets is that when they are closed or only partially opened most of the fresh air brought in by the exhaust fans will enter through the cracks in the side and end walls and not through the attic inlets. Depending on the speed of the inlet machine, it is possible that for minimum ventilation fan runtimes less than 60 seconds very little air would actual enter through the attic inlets significantly reducing the overall effectiveness of an attic inlet system. The amount of air moving into the attic after the fans shut off can be reduced by making sure that the controller activates the inlet machine rapidly in response to the decrease in static pressure due to exhaust fans turning off. With most environmental controllers there is some type of “wind delay” setting that delays the reaction of an inlet machine to a change in static pressure. A long static pressure delay setting of for instance, 15 seconds would result in the attic inlet machine remaining inactive for 15 seconds after the fans shut off, allowing a significant amount of warm air to enter the attic space. An inlet machine controlling attic inlets should be programmed with a minimal time delay, five seconds or less, thus minimizing the amount of warm air that can escape into the attic space during the closing period. Air movement into an attic space can be further reduced through the use of a high-speed inlet machine. Attic inlet machines must be able to fully open and close attic inlets in less than 15 seconds. This typically requires an inlet machine speed of at least 12" per minute, ideally 18" or more per minute. Figure 6 illustrates how leakage into the attic after the exhaust fans shut off can be significantly reduced by doubling the inlet machine speed from six (Figure 5) to twelve inches per minute and reducing the controller’s delay settings to five seconds. Air movement into the attic space can be essentially eliminated through the installation of “damper doors.” Damper doors, are basically insulated horizontal butterfly shutters installed in a duct above machine-actuated attic inlets which are held closed by a springs. The damper doors prevent warm air from moving into or out of a house whether or not the machine-actuated attic inlets are fully or partially opened (Figures 7,8,9,10,11). When the exhaust fans turn on, and the attic inlets are opened by the inlet machine, the negative pressure pulls the damper doors open allowing fresh air to enter the house from the attic. Since the opening into the attic space is in part controlled by the negative pressure created by the exhaust fans, whenever the fans are not running, the damper doors will remain closed and air cannot move into the attic space. Figure 12 shows attic temperatures in a house equipped with machine-actuated attic inlets and damper doors. The house was next to the house illustrated in Figures 3,4,5, and 6 and the graph covers the same time period. The machine-actuated attic inlets were preopened 30 seconds prior the exhaust fans turning on and took 20 seconds to fully close after the exhaust fans shut off. The three 36" exhaust fans were operating 90 seconds out of 300. The damper doors proved to be very effective in eliminating the movement of warm air into the attic space even when the attic inlets were opened and the exhaust fans were not operating. It is important to realize that since it takes effort to hold open the damper doors that the capacity of the attic inlets can be reduced 10% to 30% depending the design of the damper doors. Though damper doors can reduce the capacity of attic inlets they have shown to be the most effective way to reduce air migration due to the simple fact that the “opening” into the attic space is controlled by the presence of a negative pressure. No exhaust fans operating, no negative pressure, no opening into the attic space. Issues with condensation formation in the attic can also be reduced with any type of attic inlet system by only using an attic inlet system when the attic temperatures are above house temperatures, namely during the day. The downside of this method of operation is that it assumes that there are no benefits in using attic inlets at night. The fact is that though the air in the attic space is not warmer than outside air at night, there are a still number of potential benefits in using attic inlets 24 hours a day. This is borne out by the fact that attic inlets have been used for decades, and continue to be used, in some of the coldest poultry growing areas in North America even though the amount of attic heating which occurs during the very short winter days is minimal (Figures 13, 14, 15, 16). 1) Since attic inlets draw air from the attic space and not from exterior side walls there is essentially no wind pressure on the inlets. Wind blowing perpendicular to a house can lead to a “positive” pressure along the windward side of a house and a “negative” pressure on the leeward side house, causing air to enter the windward side of the house and exit on the leeward side of the house. If the wind speed is high enough, the wind pressures can overwhelm the negative pressure created by the exhaust fans, essentially resulting in a “naturally” ventilated house where the wind has a greater effect on air exchange rates and fresh air distribution than do the exhaust fans. The advantage of an attic inlet system is that winds do not create strong wind pressures within an attic space, resulting in improved control over house environmental conditions on windy days. 2) Attic inlets introduce cold air where the warmest air tends to collect, namely at the peak of the ceiling (Figure 17), helping to assure rapid heating of the incoming air. In side-wall-inlet-ventilated houses the cold incoming air needs to be transferred from one of the coolest locations in the house, the side walls, all the way to the center of the house which requires optimal inlet design, static pressure, and inlet opening. As house width increases, and outside temperatures drop, the more difficult it becomes to move air from a side wall all the way to the center of the house. 3) Attic inlets require a lower operating pressure than conventional side wall inlets. With side wall inlets the cold, heavy incoming air must be essentially moved “uphill” all the way to the center of the house. The colder the air, the heavier it will be, the greater the level of negative pressure required to move the air to center of the house where the majority of the hot air tends to collect. Since the air is colder, therefore heavier, at night than during the day the static pressure required at night is slightly higher than during the day when using side wall inlets. One of the downsides of operating a house at a higher static pressure is that in general the higher static pressure maintained the higher the percentage of air that will enter through cracks and not through air inlets. For instance, a moderately tight 40' X 500' house has 20 square feet of cracks. If the house’s 50, 44" long side wall inlets are opened 2" there would be a total of 31 square feet of side wall inlet opening. When the exhaust fans operate, approximately 60% of the fresh air will enter through the inlets and 40% through the cracks. If a producer needs to operate the house at a higher negative pressure the amount of side wall inlet would need to be reduced. If the side wall inlet openings were reduced to 1", the total side wall inlet area would be reduced to 15.5 square feet and the static pressure would increase. The downside is that leakage area has remained the same, 20 square feet, and inlet area has been reduced, 15.5 square feet. The net result is only 44% of the air will enter through the inlets and 54% through the cracks, possibly reducing the effectiveness of the inlet system. Since an attic inlet system can operate at a lower pressure, a higher percentage of air will tend to enter through the inlets and not through cracks than with a traditional side wall inlet system operating at a higher static pressure. 4) Most poultry houses are equipped with inexpensive galvanized door inlets which tend to perform poorly during cold weather when opened less than a couple of inches. This is because with a side wall inlet to achieve the maximum throw of the air toward the center of the house the incoming air would ideally enter a house moving parallel to the ceiling. The problem with traditional galvanized door inlets is that when opened less than a couple of inches the air enters parallel to the side wall and not the ceiling. As a result, the incoming air has to essentially make a 90-degree turn as it hits the ceiling (Figures 18,19). The 90-degree turn reduces the speed of the incoming air jet, which in turn, reduces how far the cold air will travel along the ceiling before dropping to the floor (Figures 20, 21) . This characteristic air flow pattern created by traditional galvanized door inlets is especially problematic in wider houses where the air has to travel much further to assure proper fresh air distribution across the width of the house. In contrast the air exiting an attic inlet is traveling parallel to the ceiling regardless of how much it is open (Figure 22). Since the air isn’t forced to turn, air speed of the air jet is maximized which helps insure that fresh air will make it all the way across the width of a house (Figure 23). The increased efficiency of an attic inlet is one of the reasons why it can function better at lower static pressures than traditional galvanized side wall inlets. Since attic inlets tend to be very effective in moving air toward the side wall, cool spots along the side walls can be created if precautions are not taken. This phenomena is most notable in houses using two-way attic inlets that are mechanically-actuated when opened an excessive amount and/or are operated at too high of a static pressure. In most cases a two-way attic inlet should open a maximum of a couple of inches during cold weather and the static pressure should not exceed 0.07" (Poultry Housing Tips. Two-Way Attic Inlets. Volume 22, No 4). The root of the problem is often the installation of too few two-way attic inlets. Air moving capacity of two-way attic inlets should be based on a two or three inch inlet opening and not the four-to-six-inch opening often used (Figure 24). Though technically fewer inlets would be required if allowed to open four to six inches, the problem is that larger inlet openings will tend to result in drafty side wall conditions when operated during cold weather, especially in 40' wide houses (Figure 25). Drafty side wall conditions are less likely to occur with four-way attic inlets in part because their opening is typically limited to just a few inches. With all the potential advantages related to nighttime operation listed above and the ability to bring in solar-heated air during the day, are there other ways to address the primary negative aspect of attic inlets, namely warm air leaking into the attic space when the exhaust fans are not operating? Interestingly enough, one of the best methods of addressing this issue is to use a simple, well designed, counter-weighted attic inlet. As with most poultry house equipment there has been significant improvements in counter-weighted attic inlet design over the last decade. One of the most significant improvements has been in the introduction of the four-way “drop-bottom” attic inlet (Figure 9). The original four-way inlets had four individually counter-weighted doors that could not be adjusted, were difficult to clean, and were difficult to close when not needed. 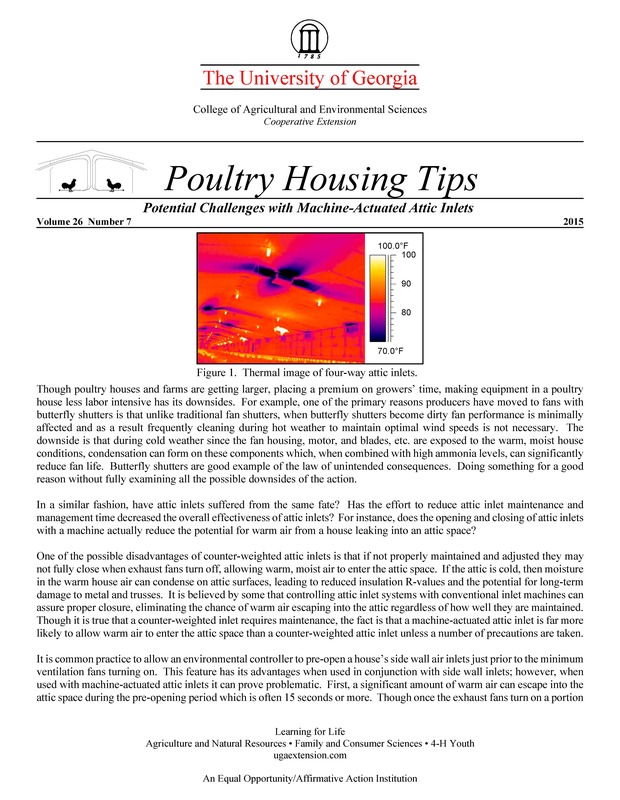 The drop-bottom inlets not only addressed all these issues, but most importantly, seal significantly tighter when the fans are off than the original four-door counter-weighted attic inlets (Poultry Housing Tips. A New Four-Way Attic Inlet. Volume 22, No 5). Figure 26 shows attic temperatures in side-by-side houses with identical drop-bottom attic inlets. In one house the attic inlets were operated using an inlet machine (30 second, pre-opening, 6"-per-minute inlet machine) while the attic inlets in the second house opened and closed using counterweights. While it was quite clear that a significant amount of warm air was escaping into the attic space in the house with the machine-actuated attic inlets, there was no evidence of any warm air escaping into the attic space in the house with the counter-weighted attic inlets. The slight variation in attic temperature in the house with the counter-weighted attic inlets was due to the natural variation in attic temperature as cooler outside air is drawn into the attic space when the exhaust fans are operating. To further reduce risk of warm air escaping into the attic space as well as to automate the closing of the attic inlets when their use is not required, some producers have added an inlet machine to the latest generation of counter-weighted attic inlets. Though the counter-weighted attic inlets still open and close based on the negative pressure created by the exhaust fans, an inlet machine essentially “locks” them closed when the exhaust fans are not operating. Approximately 15 seconds prior to minimum ventilation fans operating the houses environmental controller activates the inlet machine which essentially release counterweights on the attic inlets. The inlets will remain closed until the exhaust fans create a negative pressure, pulling the counter-weighted attic inlets open. After the exhaust fans turn off the counter weights quickly pull the attic inlets closed and the inlet machine assures the attic inlets remain closed snugly against the ceiling by locking the counter weights in a closed position. The inlet machine does not eliminate the need for the cleaning of counter-weighted inlets but if they are not properly maintained the producer is assured that they will remain fully closed when the fans are not operating. The fact is that there are advantages and disadvantages to any piece of equipment installed in a poultry house. Tunnel ventilation results in high electricity costs and bird migration but reduced bird mortality and improved performance. Evaporative cooling pads results in high water usage and wet litter, but significantly cooler temperatures during hot weather. Tube heaters can result in excessive ceiling temperatures but improved floor temperatures. Totally enclosed houses result in lower heating costs but the increased likelihood of catastrophic bird loss in the case of main breaker or generator failure. Our houses have evolved by acknowledging, managing and controlling potential problems. The increased popularity of growing birds without antibiotics and increased emphasis on bird welfare and dry litter will increase the pressure placed on producers to maintain optimal air quality during cold weather. Optimizing air quality in a poultry house is all about maximizing poultry house air exchange. Its quite simple, the greater the volume of air exchanged, the fresher the air in a house and the dryer the litter. The problem of course is that exchanging air in a poultry house during cold weather requires supplemental heat. Considering that ventilation accounts for 80% of the cost of heating a poultry house, it is not difficult to predict that the cost of heating a poultry house will likely increase in the future. Attic inlets offer a unique opportunity to utilize an essentially a “free” source of supplemental heat that can be used to offset propane/natural gas usage. As with any new technology, there can be a steep learning curve both in terms of equipment design and management (Poultry Housing Tips. Attic Inlets Operation Guidelines. Volume 25, No 2. Basic Attic Inlet Operation. Volume 19, No 13. Are You Getting The Most Out of Your Attic Inlets. Volume 22, No. 3. Attic Inlet - Summertime Operation. Volume 20. No 9). It is important to keep in mind, in order to advance, challenges must be addressed and overcome, not backed away from and avoided.